As we continued to cruise north along the Norwegian coast towards Flåm the days got longer until it was never dark outside. The sun did dip just below the horizon for a few hours in the middle of the night, but it remained dusk. For a moment I wished that we had an interior cabin so we could have darkness overnight. However, I quickly got over it as I stared at the stunning coastline taking us to Flam. 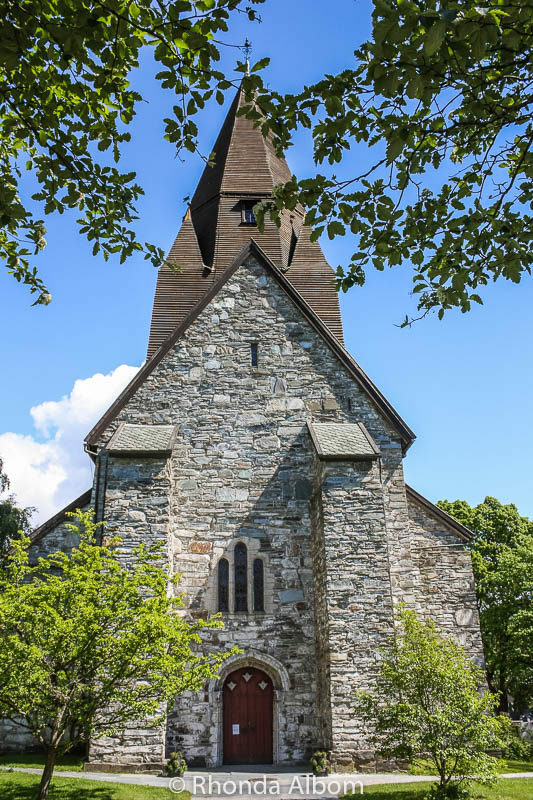 Flåm is considered one of the most beautiful spots in the world, and now we know why. On our way, we had a full day at sea and woke up on the third morning to exquisite views out the cabin window. It wasn’t until we went out on deck that the massive beauty took my breath away. We typically do our own thing in cruise ports. Not today, not in Flam. There is too much to see, too little time, and an excursion that goes exactly where we want to go. 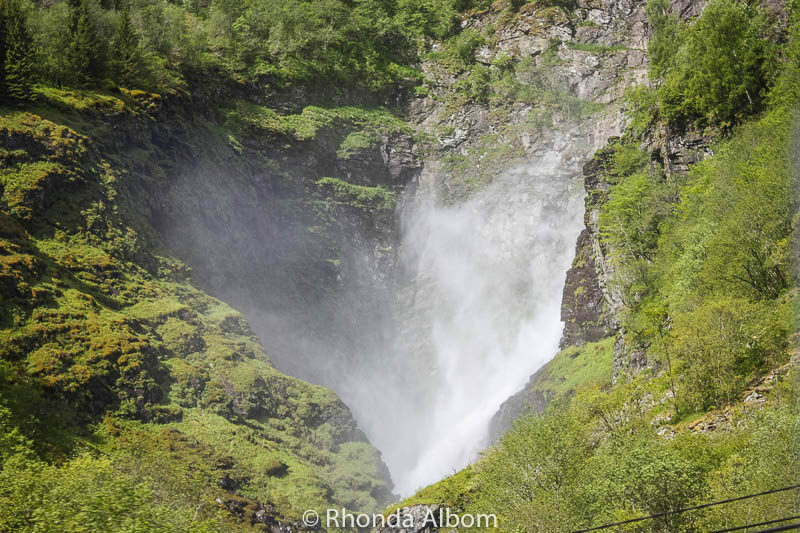 Our excursion included a coach trip up the fjords with a stop at Tvindefossen waterfall (the fountain of youth) and two trains down, including the world famous Flam railroad. Interesting local guides joined us along the way, and they were all great – the crew from the MSC Opera are another story. Our group was allocated a train car, and to our surprise the crew from our ship hopped on first, grabbing the best window seats for themselves. By the time we boarded, one of the crew members, who was sitting with his mate actually told my girls they had to sit with strangers as there were no more seats together. Makes you roll your eyes and wonder if MSC offers any customer service training to its staff. Our first view of the Fjords, from the deck of the cruise ship. In port at Flam, also shot from the ship. 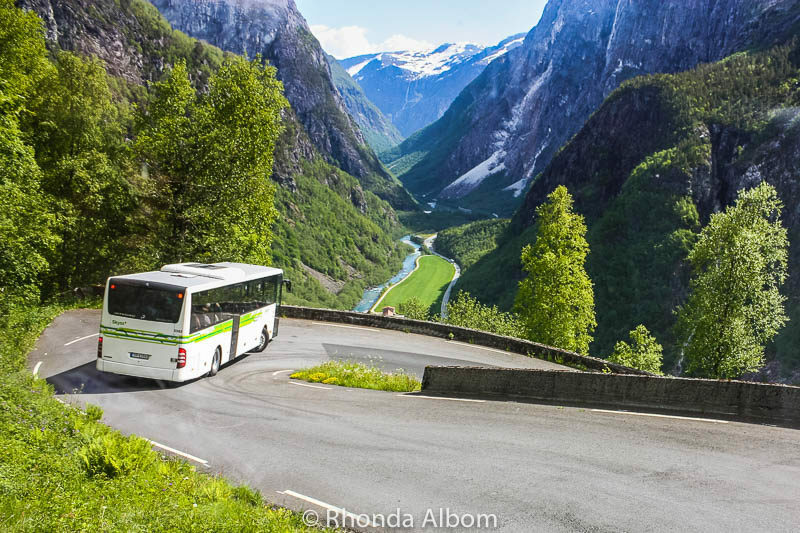 This is one of the 13 hairpin turns on the road through Norway’s Stalheim Valley. 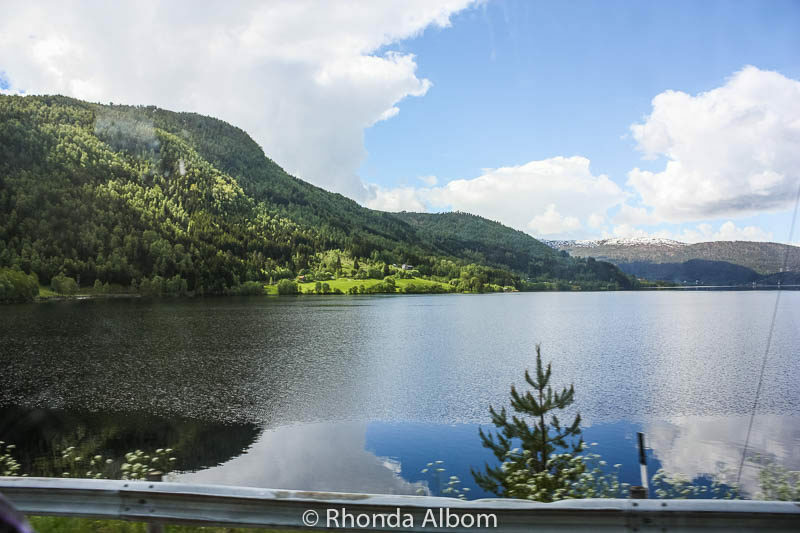 We were on a bus tour from Flam to Voss. The fountain of youth – myth or reality? 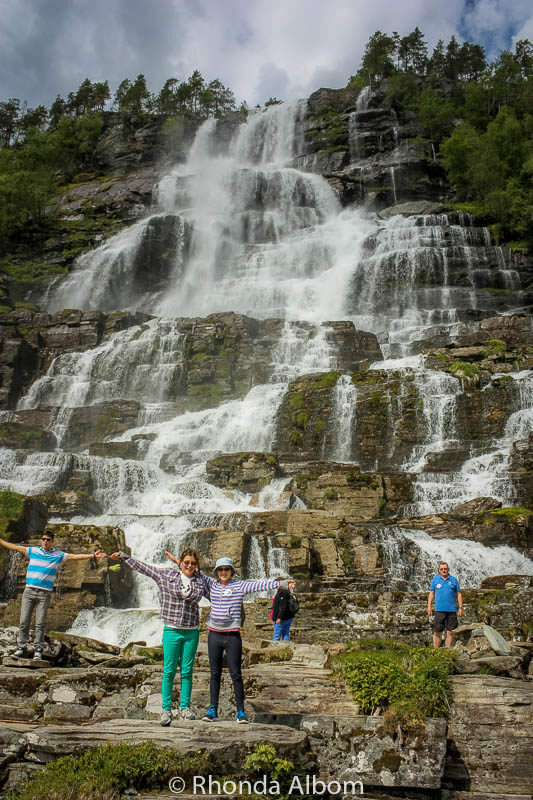 According to folklore and our extremely youthful looking Norwegian guide, Tvindefossen Falls is it. Located somewhere between Flam and Voss in Norway, we stopped, climbed and drank, using our hands to cup the water. Did it work? Maybe yes, maybe it’s just silly, but either way, it was one impressive waterfall. A better-known legend regarding the fountain of youth gained popularity in the 16th century. It is said that the Spanish explorer Juan Ponce de León, first Governor of Puerto Rico, was searching in 1513 (in the area that is now Florida) for a fountain that could restore youth to anyone. Is this another myth, or reality? Either way, he never found it. Maybe that’s because he should have been looking in Norway. 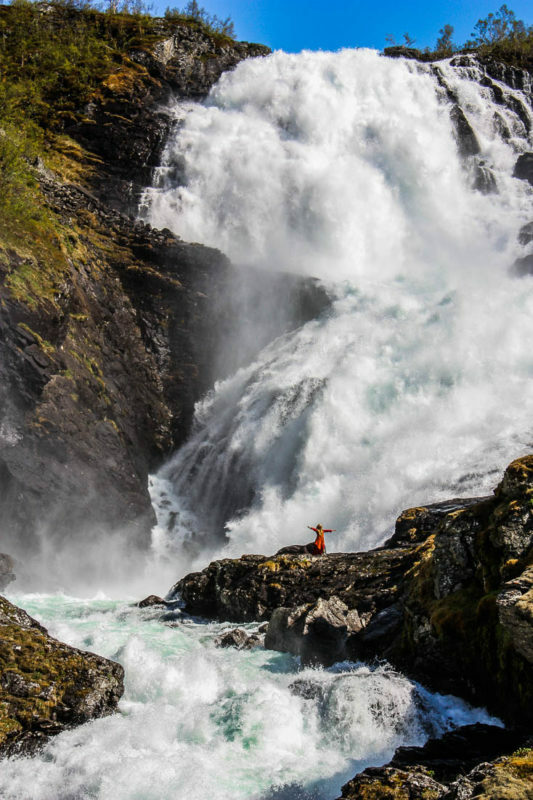 Is Tvindefossen waterfall the fountain of youth? Our girls stop their climb for the photo. A snowy landscape, seen from the train as we passed. As we got lower in altitude, the lush green landscape returned. 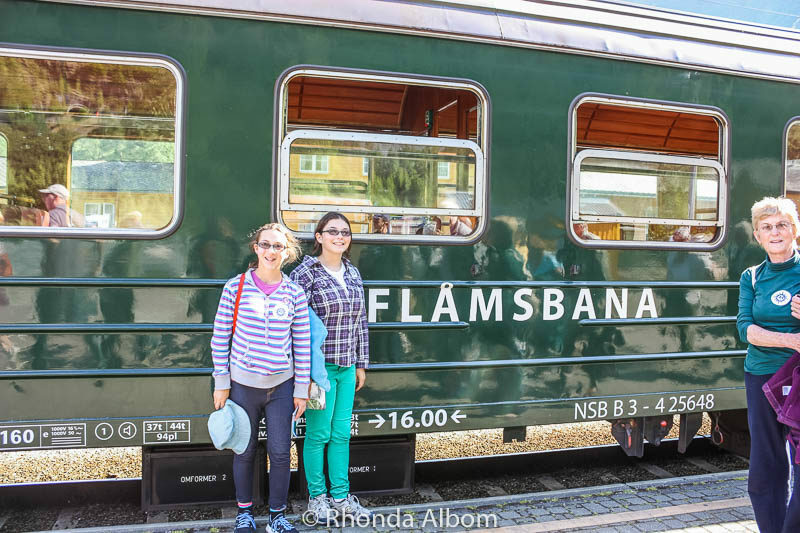 The girls in front of the Famous Flam Railroad which climbs steeply up from sea level to 867 meters high over a distance of just 20 km. Can you see the “Huldra” in orange on the lower ledge – she is a mythical creature that attacks men to either kill them or make them do work. You can identify her as she has a cow’s tail under her dress. Kjosfossen Waterfall is a stop on the Flamsbana train from Voss back to Flaam. Flam was our first of three ports in the Norweigan fjords. It was the northernmost fjord we visited, followed by Bergen and Stavanger. Our cruise originated in Southampton, England. While I am not a big fan of MSC, I believe cruising in the best way to see the fjords. What do you think of Flam? Do you think we really found the fountain of youth? It’s even better live. The sound is so loud it really adds to the majesty. Those are beautiful falls. I like how it just keeps splitting into smaller falls as it makes its way down. I think I’d drink from these falls but my hubby would be convinced he’d get some sort of illness from it. I would love to visit Norway sometime. Funny thing is we never gave illness a thought. It turned out ok for us. 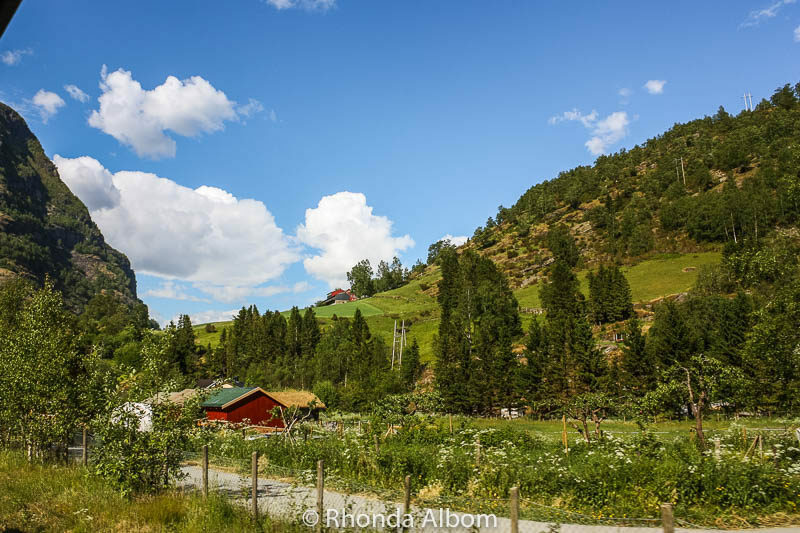 Norway is pretty spectacular, and really expensive. We were glad we cruised there. That last photo is just stunning. So majestic! Wonderful capture of nature with a fantastic sense of scale. And you could get so close, too. That last shot is incredible! Missed this in 2008 when visiting Norway. Gorgeous photos! I’ve always wanted to see Norway. This makes me want to go even more. Thanks for sharing, Happy A-Z! Both falls are gorgeous. I would’ve been there for hours taking photos. WOW…what a waterfall sounds like it took some doing to get there. Perhaps you’re not old enough to know if the water worked, lol. What a fabulous waterfall. I’d definitely be drinking gallons of water just in case it does work! My answers are no, yes, no and yes! I wonder why I haven’t been to Norway yet? Thanks Rhonda Albom! 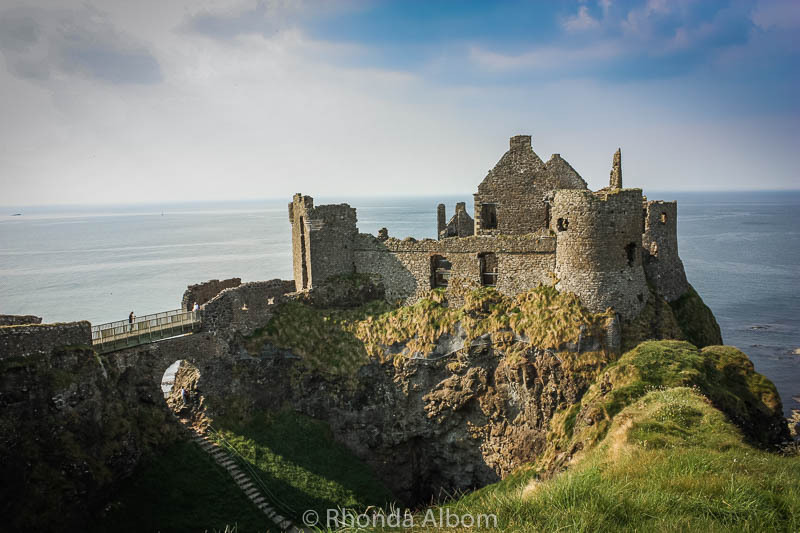 Love your photos & travel insiprations. I have been to Bergen once. 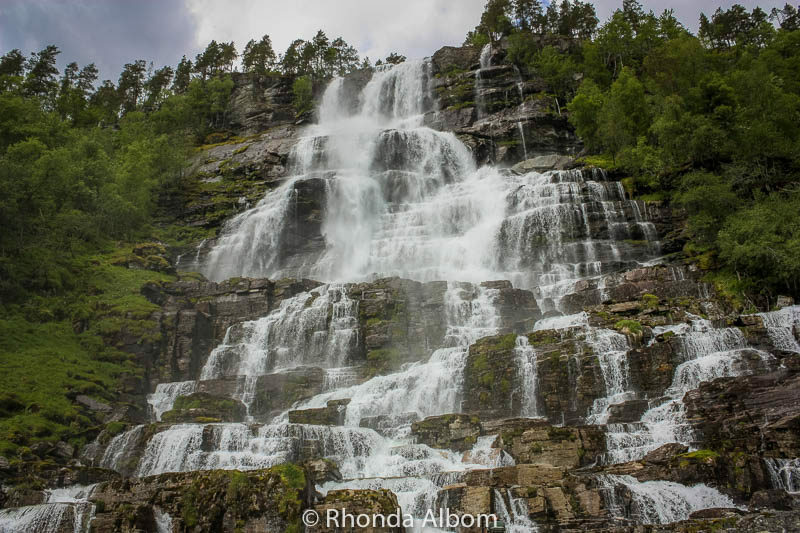 Hopefully in the future, we will also travel to other parts of Norway, including Tvindefossen Fall – to drink the fountain of youth water, with our baby Ren. 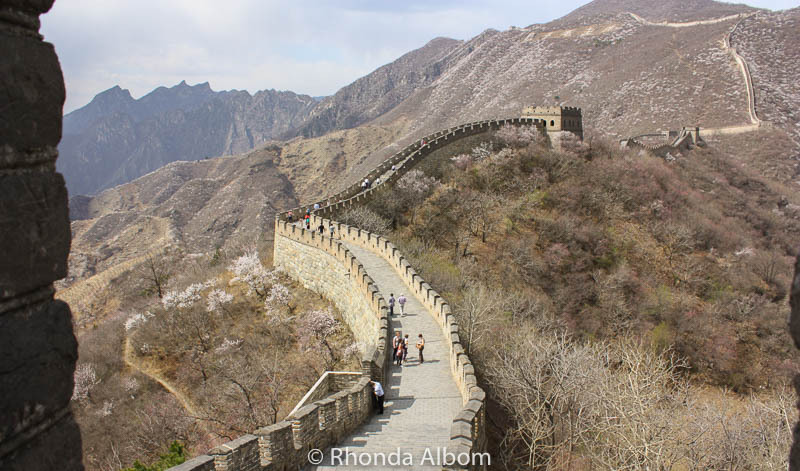 Do you have favorite destinations for traveling with toddlers / young children to recommend? Bergen is a beautiful city. It’s been a long time since my girls were toddlers and I think they liked anywhere that allowed them to be kids. Before they reached the age of five I think we only traveled in North America, Caribbean, and the South Pacific. My favorites with Toddlers – city: Toronto; tourist destination: Legoland near San Diego; and resort Island: Fiji. We traveled and moved to New Zealand when they were 3 and 5 and they have always loved it here. Impressive waterfalls. Let me know if it works and I’ll be buying a ticket to Norway. It’s far from Brisbane, I know because Brisbane was our first stop on the way. Of course we went the long way, taking about 3 months before we got to Norway. I’m going there! I need a little youthful elixir! All this time I thought the Fountain of Youth was in Florida! I would have enjoyed seeing the falls, but don’t know if I would have made that climb. It’s beautiful, but knowing me I would have slipped and broken my neck. That’s gorgeous. I would want to drink from it just because it sounds like it would be cool to drink from a waterfall. Now that is what I call a waterfall!!!!! Woweeeeeee! Wow, those are some impressive falls! If your kids never grow up, you’ll know it worked. Probably :). Awesome pictures mum! I agree, Norway is lovely. Cheers for sharing with us your web page. 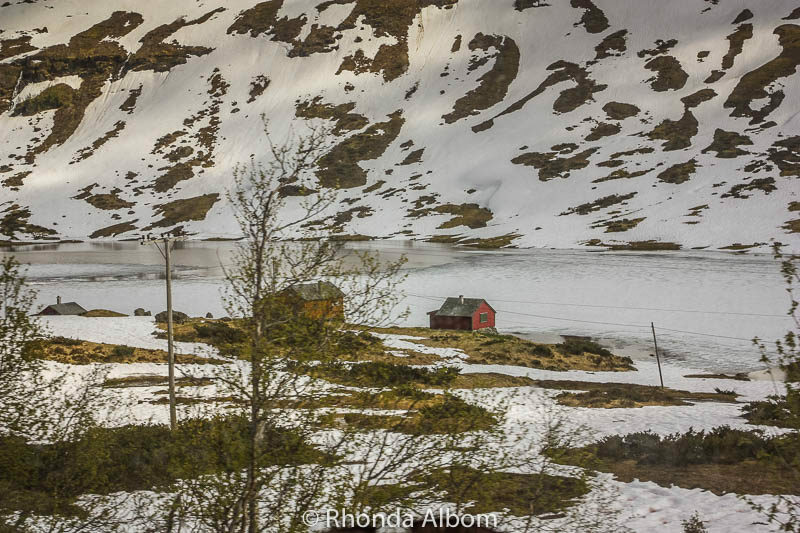 Your photos of the Fjords are beautiful. You are lucky you saw the fiords during sunshine!! All we saw was drizzle. Yes, they sure are beautiful. Wow this looks amazing, I would love to go there one day. Be sure to give a thorough rating of MSC and their crew, I am sure you will. Having spent all that money passengers deserve better. LOL – the comment form left only three small lines for comments and I had to write about the safety issues we had at the beginning. It was all a shocker, but it was really cheap – I guess you get what you pay for 🙂 As for the excursion, the staff was shamed into getting up and giving the girls the seats, so in the end it all worked out ok.
Wow, what an experience. 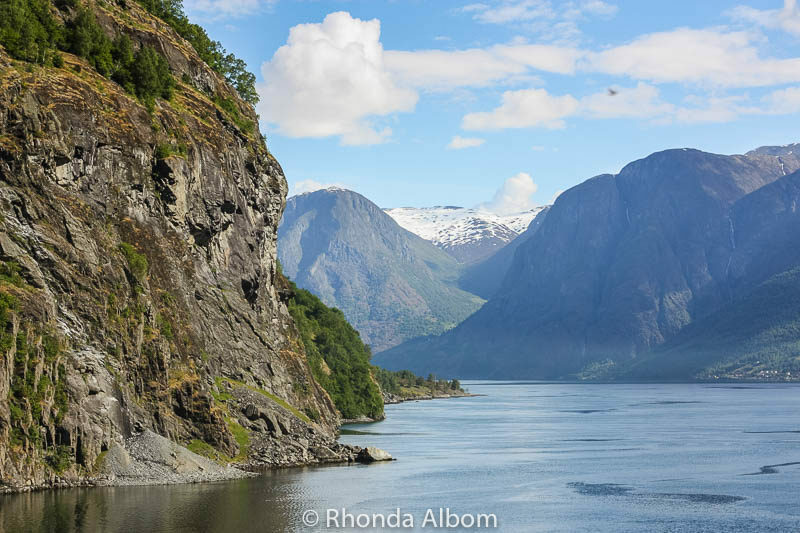 The fjords are breathtakingly beautiful. Have you been here Jenny? It is so spectacular, there are not words for it. It is even better in person. Hope you get there some day. Wow. I want to go. Photos never really do landscapes justice, so I’m sure it’s even more beautiful in real life. Looks gorgeous all the same. I hope you get there some day. It was so lovely. That is some beautiful country side. It was amazing. 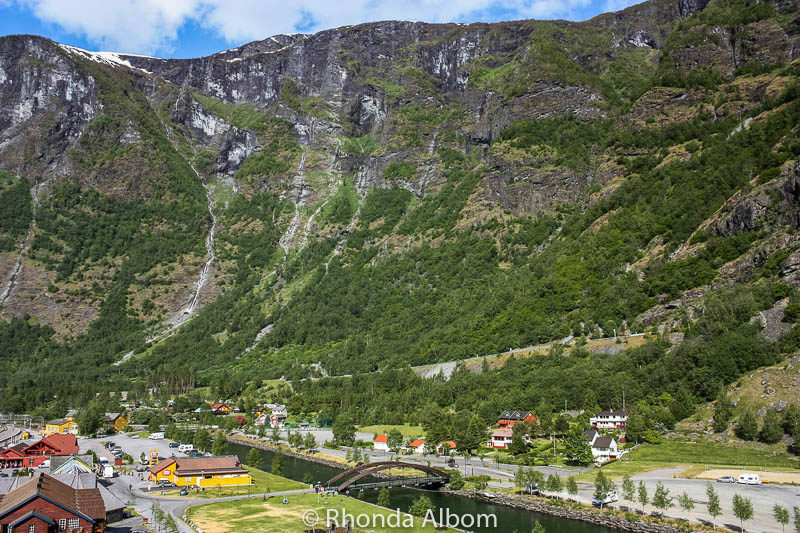 Plus to get to Flam, which is deep in a fjord, the ship traveled for seven hours where we had spectacular views. It was mostly overnight, but this time of year in that part of Norway, it is never dark. Gotta love midnight sun. Wow, it’s beautiful indeed. I’d love to visit there someday and we probably will too. Oh, I hope you do. It really is so much more spectacular than these pictures can depict.